A wheelchair ramp is an inclined slope constructed to support the passage of a wheelchair in place of staircase for the purpose of disabled persons. It also grants easier entry into a building for people using scooters, strollers, carts or any other wheeled object. Wheelchair ramps can be permanent, semi-permanent or portable. Material options for wheelchair ramps include steel, aluminum and concrete. Wood--especially treated or cedar--offers economic and attractive construction options. Please review the American Disability Act guidelines, listed below, before embarking on this project. Measure the height of your step. ADA minimum specs for a ramp is 1:12 (for every inch of height there must be 12 inches of length) with at least 36 inches of width available at the top of the step. Based on a standard 1:12 slope and step measuring 6 inches height, allot at least 72 inches length and 40 inches width (handrails included) for your ramp. Visualize the product. Measure and make markings where the various parts of the ramp including the base posts should be. After making your calculations, attach a 2x4 board slightly below the stair riser. This is where the top of the ramp will rest. Construct the posts. Dig holes and cut the posts such that they are 24 inches below the ground level and extend 36 inches vertically above the surface of the ramp. Use 4 x 4 boards to erect the posts and pour concrete into the space around the posts to make them intact. Make a strong base. After the posts, place vertical 4 x 4 pillars at 16 inch intervals along the ramp sides, between the increasing gradient and the ground. Along the gradient, construct the ramp's base using 2 x 4 floor boards screwed onto the support pillars in a ladder-like pattern across the width. Create the ramp. Cut a piece of plywood or lumber 72 x 40 inches (using 1:12 ratio, 6 inches x 12 = 72 inches.) Lay the top of the 72-inch plank onto the 2 x 4 board previously attached under the stair riser (step 2.) Screw it onto its "ladder" floor base and cut notches out to fit between the bottom posts. Attach the handrails. Extend each pillar on top of the ramp so that the wooden handrails can be screwed on and aligned from the bottom post along the entire ramp length. Finish up the project. Secure the ends of the ramp with heavy wood screws. Sand, seal and varnish wood. Add a metal threshold to prevent chipping of the wood and rubber grips to prevent slipping. 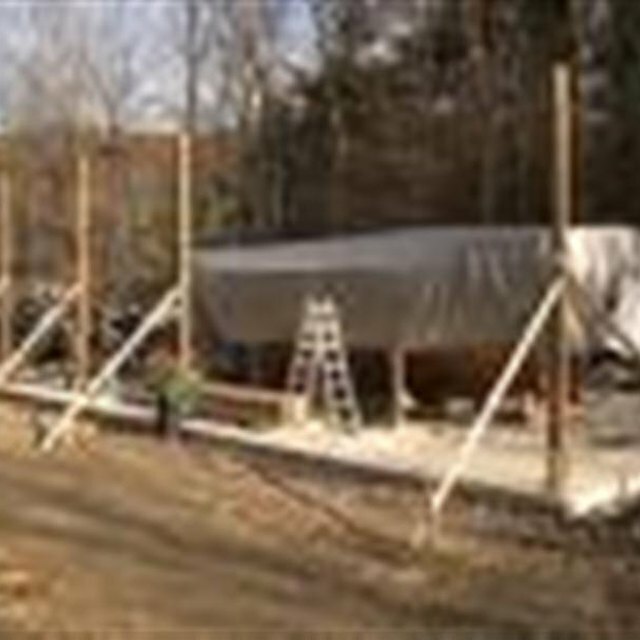 Your ramp should have a solid built, be wide enough, be very safe and be sturdy to support different weights on wheels. Lawsuits have occurred when people have been damaged using unsafe ramps. Adhere to all Americans with Disabilities Act stipulations. The ADA excludes private homes but mandates that public buildings have at least a 1:12 ramp i.e. for every inch of height there should be 12 inches of length but 1:16 and 1:20 ramps are not as steep and much preferred. Cross slopes must be less than 1:50. The minimum ramp width must be 36 inches and have continuous edge and surface protection like rubber grips. They also should have landings at the top and bottom that are as wide as the ramp and at least 60 inches long. Handrails are required on both sides of all ramps that rise steeper than 6 inches or have a horizontal projection of more than 72 inches. Trinidadian-born Kebrina Maharaj currently resides in Miami, Fla. Her innate creative talent was nurtured since the age of 7, when she wrote her first published short story. Maharaj's growing repertoire of stories and commentaries was featured in her island's publications, and she became editor of her high school newspaper. In 2008, Maharaj attained a Bachelor of Science in mass communication from Florida International University.